For its 39th season, Music From Japan presented music from Okinawa, the chain of islands that make up the southernmost prefecture of Japan. 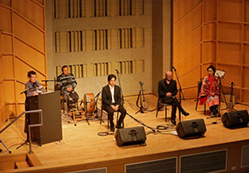 Naoyuki Miura, Music From Japan’s Artistic Director, worked closely with the band The Ryukyuans to develop a program of diverse Okinawan music in what would be their North American debut. The Ryukyuans performed a wide variety of traditional and contemporary songs, representing several of the many cultures and languages found in the expansive Ryukyuan archipelago. Each band-member’s own cultural heritage and music path is unique, yet they share an interest in contributing to the rich Okinawan folk-music tradition by breathing life into traditional songs and performing new works. 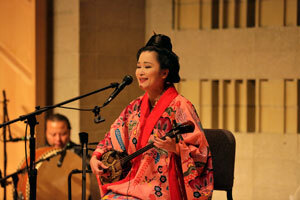 The three-stringed sanshin, the quintessential Okinawan instrument, is central to the music of the Ryukyuans, as it has been central to Okinawan music for centuries. The first concert was preceded by a lecture-demonstration led by Sharon Nakazato. Sharon began by sharing some background information about Okinawan music, language, and culture gleaned through her own research and from the Ryukyuans. Each musician then discussed the basics of his or her instrument and approach to voice. In Songs of Okinawa: Tradition and Today, The Ryukyans performed folk songs from their respective cultural origins: Yukito Ara representing the Yaeyama region, Isamu Shimoji the Miyako region, and Shinobu Matsuda the Okinawa main island. 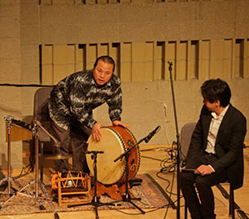 Throughout much of the program these musicians were accompanied by Satoshi “Sunday” Nakasone who performed on the shima-daiko, the Okinawan version of Japanese percussion. The program began with Yunta Shoura, a traditional antiphonal song usually sung in the workplace or during celebrations; it was beautifully interpreted by Yukito and Isamu, who sang without accompaniment. 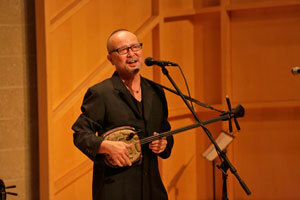 Isamu then took the stage alone to perform songs from the Miyako region of Okinawa. 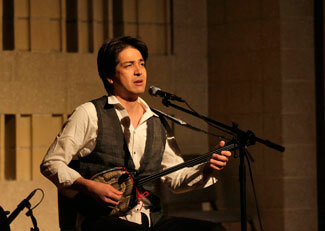 The spare sanshin playing, coupled with longer vocal phrases, created an evocative, melancholic atmosphere. 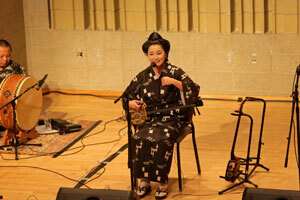 Next, Shinobu Matsuda, wearing a traditional Okinawan kimono, performed folk songs from the Okinawa main island. These pieces tended to be more upbeat, and featured a sanshin accompaniment that was more dance-like than the opening songs of the evening. After intermission, the sound of waves on a beach created the setting for Yukito to take the stage. 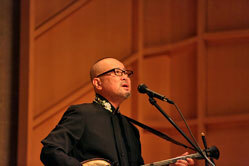 He shared songs characteristic of his birthplace, the Yaeyama Islands, as well as a Ryukyu dance song called Kanayo/Amakaa. The rest of the program offered more modern pieces, written from the middle of the 20th century through to today. 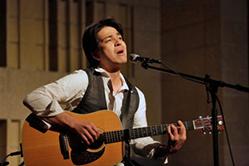 Some of the songs had lyrics written by Isamu or Yukito, or music composed by Isamu, and all incorporated elements of American popular music while still bearing the stamp of Okinawan folk song. 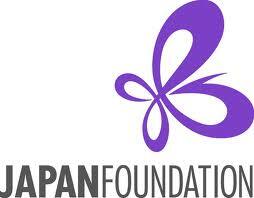 The evening ended with an encore entitled Honen Ondo or “Harvest Song” performed by the entire group. This number was upbeat and heavily influenced by American rock music. As the song neared its conclusion the tempo increased, making for a high-energy finale to a diverse night of music. 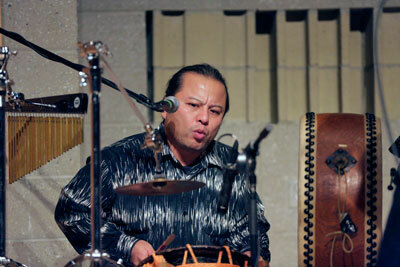 On Sunday, in New Songs of Okinawa, The Ryukyuans focused on more contemporary repertoire. 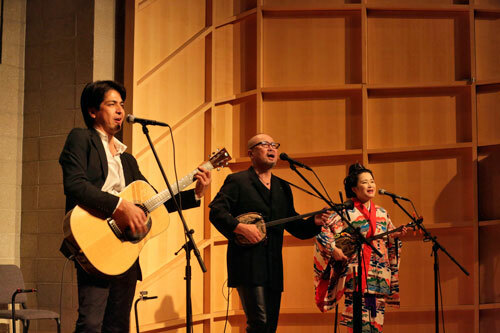 The evening was, nonetheless, peppered with more traditional songs, including some reprised from the previous night, reminding listener and performer alike of the important connection to tradition that is still part of Okinawan popular music. 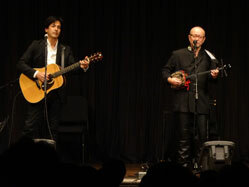 In some of the newer pieces we could hear the strong influence of American popular song on modern Okinawan music: Jazzy Myahk was appropriately jazz-infused, and featured a section in which the lyrics were delivered rapidly on a single pitch, evoking the sound of American rap music; Last Waltz and That Summer Day, both sung with standard acoustic guitar, are beautiful modern ballads with melodic content similar to that of American love songs. 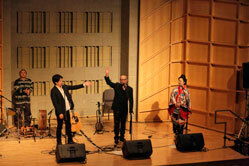 The afternoon ended with two encores: Honen Ondo and Shidei Gafuu or “A Prayer for Blessing and Joy.” The latter was written especially for the 2014 Festival and commissioned by Music From Japan; with lyrics by Yukito and music by Isamu, it featured an energetic call and response between the members of the band. 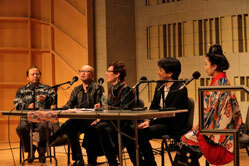 The Sunday afternoon concert was followed by an open forum entitled “Creative Process and Language in Okinawa,” moderated and interpreted by Sharon Nakazato. Discussion topics included the backgrounds of the musicians, the many languages of Okinawa, and the process of writing culturally and politically responsible songs.